I always wanted to make oven roasted potatoes, I tasted a lot of this dish from school cafeteria, from my customers and from my friends. It all tasted differently. It really depends on what spices you put in it. There is no unique way to make them, so be creative. 2. 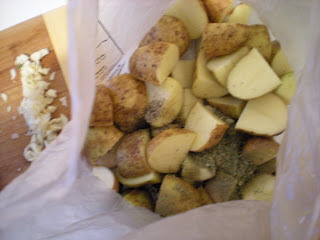 In a large ziploc bag, combine herbs, potatoes, garlic, oil, salt and pepper. 3. 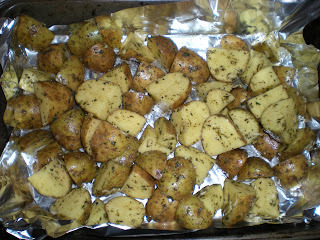 Transfer potatoes on an oiled 11'' x 7'' baking pan. Bake for 25-30 mins. Turn occasionally. Insert a toothpick to check for doneness, no resistance should be felt. Italian seasoning and herbes de Provence are a combination of many spices. If you are not a spice person and feel that they take too much space in your drawer, these mixes of spices are a space saver. Italian seasoning is a blend of dried basil, marjoram, oregano, thyme and sage. There are variations some include coriander and red pepper flakes. Herbes de Provence is a mix of dried marjoram, thyme, rosemary, basil, savory, sage and fennel seeds. kind of hard to go wrong with a classic like that. i like your herb choices. 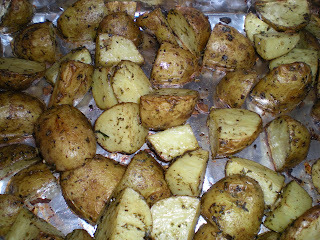 I always revert to rosemary... nothing wrong with that, but I should branch out next time I roast some potatoes. Thanks for the suggestion, I should try this next time.